The Pioneer Hotel with the Agnes Sawyer maple tree seen on the right side. The tree is located at “It’s a Burl,” a business located about two miles north of Cave Junction and about a fourth of a mile north of the Kerbyville Museum. The Oregon gold rush of 1851 started in Illinois Valley and the town of Kerbyville was established six years later about two miles from where the first gold discovery had been made. 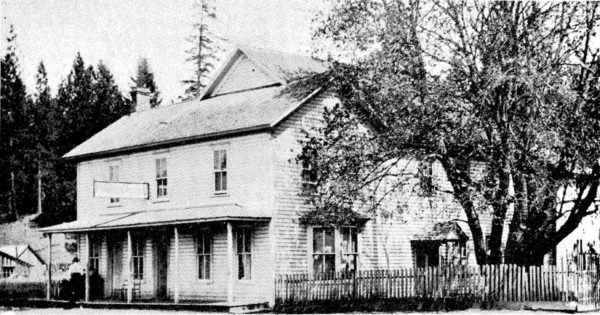 The first lodging to be established in Kerbyville was the Sawyer Hotel, built by William Sawyer around 1858. In 1861, his wife, Agness Sawyer, planted a maple tree next to the hotel, presumably with the intention of growing a tree to shade the building to keep it cool during summer months. This is the same year that the American Civil War started, hence it is the Valley’s Civil War Tree. The image below shows the present-day grounds of “Its A Burl” with the Pioneer Hotel superimposed to illustrate its approximate location. An arrow points to the tree. The historic Pioneer Hotel is superimposed to show its approximate location with the Agnes Sawyer tree identified by an arrow.